We generally think Microsoft dominated the enterprise apps segment only.But we forget that even our personal life revolves around Microsoft products like .xls or .doc. In a lot of ways, Office seems irreplaceable from our digital culture—even as other buzzy services like Slack or DropBox or Trello are gaining traction. Outlook does have more capabilities and has far more popularity with advanced calendar option that makes it attractive for users, especially within an organization. Microsoft’s biggest advantage is definitely with Excel. This has always been a make or break for companies who cannot wrap their minds around operating without it — especially for Excel power users, who take advantage of its true potential. 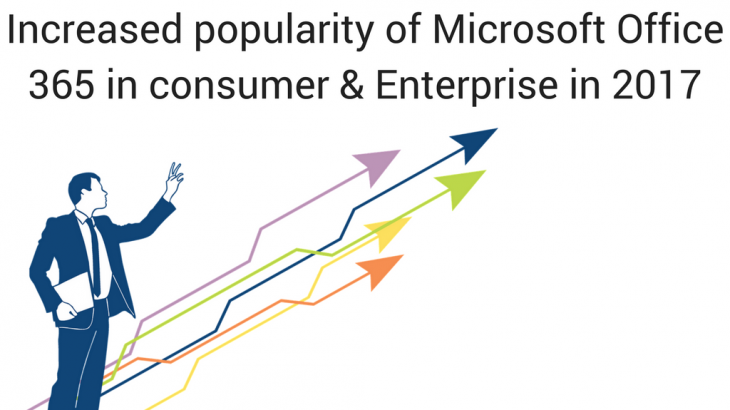 Four years after the introduction of Office 365 for consumers, Microsoft last week said subscriptions to the productivity software had reached nearly 25 million.Microsoft launched Office 365 for consumers in January 2013. Subscribers, however, were harder to find last year than in 2015, according to the numbers They reported: Additions to Office 365’s rolls were down 62% in 2016 compared to the year before. In a filing with the U.S. Securities & Exchange Commission (SEC), Microsoft pegged the number of consumer Office 365 subscriptions in the December quarter at 24.9 million, an increase of 900,000 from the September quarter and 4.3 million more than a year earlier. In each of the last three quarters, Office 365 grew by about 900,000 subscribers, the smallest quarterly increase since early 2014. Prior to the nine-month stretch of 2016, subscribers were accumulating at rates two to three times larger per quarter. Logix Infosecurity recognised as Best Microsoft Cloud Provider last year are serving more than 300+ clients. Microsoft Office 365, Microsoft Office 365. permalink. Is a free email solution right for your company? 5 reasons why organization needs Data Loss Prevention or DLP Solution?